Online transcription jobs are one of the few profitable online works to earn from home. Transcription is not a rocket science, anyone with good typing and listening skills can do transcription work. While the companies only hire experienced and professional transcribers, there are many online transcription sites for beginners who’ve got no transcription based skills. Work for general transcription jobs on websites to earn up to $10/session. Do transcription jobs from your home sitting in a couch at own convenient timing. If you’re a complete beginner to transcription, this is what transcription mean – The process of converting a source form(mostly audio or video files) into written form or text form. In the case of Online transcription jobs, the transcriber will be paid for converting an audio file to the text document. In the process of transcription work, you will be given with an audio file that contains recorded voice. You must carefully listen to the audio and type the content in the given software. This is almost similar to online typing jobs or data entry jobs but the person should have both sharp listening skills and fast typing skills. Usually, general transcription jobs pay the workers in pay per minute basis. For example, if they pay $1 for transcribing one-minute audio. The transcriber can earn $3 for transcribing an audio that runs for 3 minutes. Similarly, few transcription sites work on the pay per word basis. In this case, the transcriber will be paid based on the number of words transcribed. Sometimes, the transcription should be done in different languages. Like the audio will be in French and the text should be in English. Transcription works based on translation pay more money compared to general transcription jobs. To work for online translation job the person need bilingual skills. Apart from the main transcription work, you can also work for addon processes like proofreading the transcribed document, accuracy verification, translation as mentioned above, copywriting, quality control etc. Hope, now you would have got an idea about transcription jobs. Here the list of some of the transcription jobs available on the internet and in companies. The general transcription jobs are the easiest transcription jobs available for almost all the internet users. No special skills, certifications are needed to get this job. Anyone who got a proper device, basic knowledge of listening, understanding the audio and average typing speed is fit to do this job. These jobs will be the stepping stone for beginners who are starting their transcription career. Usually, these jobs are available on basic transcription sites and micro work sites. The transcription project will be split into small tasks and assigned to the multiple transcribers. After completing the transcription, the work will be verified and combined again. The completed work will be delivered to the clients. In general transcription audio from any category will be assigned to the transcriber. Technical transcription work like medical transcription and legal transcription won’t come under this category. Work like transcribing raw audio data, videos posted for marketing, YouTube videos, subtitling, courses, songs etc. These are low paying, yet promising one. If you’re the beginner to the online transcription work, this is the only source to search for this job. Earn from $0.01 to $0.50 for transcribing one minute video. The payout varies based on the language, demand, intent, and skills. Medical transcription jobs are one of the reliable jobs in this category. The Medical transcriptionist listens to the recorded audio of the physician and converts it to the written form. In some cases, the medical transcriber will connect the physician virtually to do the transcription work. Medical transcription jobs are available in companies to work from office or work as a freelancer from home. Since this job is bit technical the candidates with medical transcription diploma or an associate degree have higher chances to get hired by the clients. Refer your local educational institutions to find a part-time degree or certification courses associated with medical transcription. Complete the course and apply for the medical transcription job with certification to get hired. In addition to certification, be advised that typing speed is really important too. Medical transcription jobs pay enough money to make a living with that income. Search for the job in local job boards to work as a full-time medical transcriber in hospitals, clinics or office. To find work from home medical transcription job refer the sites listed below. The legal transcribers process the audio files for courts, advocates, law offices. Legal transcription work is the highest paying for translation jobs in some of the countries. Generally, these jobs are available both online and offline. To apply for the legal transcription jobs, the transcriber should complete the relevant courses. Legal transcription might be a little difficult since the transcriber should filter unnecessary words. In addition knowledge in law and good typing skills should help to do better. Working in real time transcription process in interview, conference, seminars, webinars are some of the examples of real-time transcription work. Based on the job, the transcriber will be asked to be in the spot or connect virtually to transcribe the speech of the professionals. Only the best of bests will get a chance to work for the companies that work on real-time transcription process. The transcriber should complete a degree or transcription certification courses to apply for such positions. After several steps of interview and filtering process, the best transcriber will be hired. 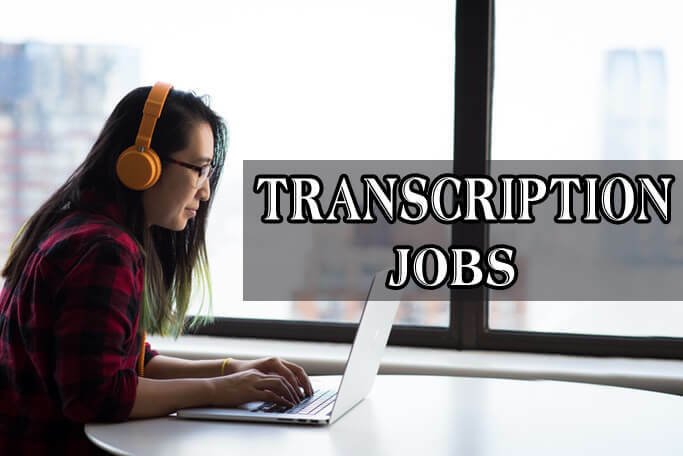 Apart from these, here are few more mentionable transcription jobs – Academic transcription, technology transcription, business transcription, market research transcription, sermon transcription, podcast transcription. These are some of the basic requirements work on transcription projects from home. Need a PC or Laptop with high internet speed connection. In most cases, mobile phones are not compatible. Speaker or earphone to listen to the audio. The foot pedal is optional but a recommended add-on to work with ease. Good listening skill is the most important requirement to maintain accuracy. Should able to type at a minimum speed of 45 WPM. However, there are transcription sites that hire slow typers. Few companies ask for transcription training completion certificates. Must pass the basic tests conducted by the transcription sites. Transcribe Me is the best highest rated work from home transcription site. Become the part of their unique community to work at one of the best transcription companies. Also, connect with thousands of transcription professionals all over the world to improve your skills. TranscribMe is the beginner-friendly transcription site, open to transcribers from all the countries. You need a computer and a reliable internet connection with the ability to transcribe audio or video. Apart from English, TranscribeMe supports multiple languages including Chinese, French, Spanish, Deutsch, Italiano, Portuguese. So, if you’re not an English speaker sign up at TranscribeMe to work for tasks in other supported languages. TranscribeMe pays around $15 – $22 per audio hour, with $250 earnings per month on average. Be advised that the Medical and Legal transcribers are paid higher rate. The transcription tasks posted on TrancribeMe will be 1 – 4 minutes clips which are easier to complete with high accuracy compared to long interviews. Complete as many tasks as you can at the spare time as long as the accuracy is maintained. New transcribers should take their entrance exams. TranscribeMe will take up to 12 business days to contact you. Even if you fail in their exams, you can attempt multiple times. Once hired, you can complete transcription tasks to earn money and Get paid to the nominated PayPal account on weekly basis. Rev is the language-based online workplace that has four different job positions. Become a Transcriptionist, Translator, Subtitler or Translator on Rev. It pays the best rate in the market from $0.36 to $0.65 per audio minute for transcription work. The Subtiler work pays $1.50 to $3 per video minute. Join Rev and complete the Grammar and transcription test and get your account approved within 48 hours. Log into Rev at your convenient timing, choose your own projects to work. Get paid as soon as you complete the job and grow your career skills using their coaching and feedback. I will recommend the person with bilingual skills to choose Rev and work on their different projects to earn maximum money. Rev freelancers receive weekly payout via PayPal for all completed works. Scribe pays $5 to $25 per audio hour. The scribe offers 4 types of work with transcription as the primary job. Work as a transcriber, proofreader, reviewer or Quality Checker. Earn up to $1000 working on assignments in all the four categories. The automated transcript feature will help the transcribers by transcribing the audio file with 60% to 90% accuracy. So, all you have to do is with the assistance of the automated transcript, complete the job with full accuracy. Initially, the audio file will be split into small parts up to 6 audio minutes. Then the tasks will be assigned to the transcribers, with the assistance of the automated transcript the transcription job should be completed. The completed job will be reviewed and then verified again by proofreaders combining transcript. After the final quality check, the payments will be added to the account. In addition to task payments, Scribe pays $5 bonus for every 3 hours completed each month. New applicants must apply for the job, confirm their email address and wait for the invitation. Then create an account, submit the test file and get certified. Workers can withdraw the earnings anytime through PayPal. The Go Transcript is the online only transcription and translation company. Their growing platform welcomes the skill transcriptionist who takes pride in their work. Go Transcript has a steady stream of projects waiting for the transcriptors. Join their company, work from home at your own convenient timing to earn money. Also, grow your skills by learning from their feedback. Go Transcript works on English based transcription. Join their site, pass the test job and get started with real projects. Earn up to $0.60 per audio/video minutes. Even if you fail the test get a chance to take the test after a few days improving your skills. The previous experience of taking the test will help you to pass in the upcoming attempt(s). Go Transcript works best for beginners with good language skills and average typing skills. They give up to 6 hours to transcribe a 10-minute video or an audio. Go Transcript pay every Friday through PayPal or Payoneer. QuickTate is an elite Transcription company works with authentic transcribers with exceptional skills. Earn money on QuickTate by transcribing legal file, medical files, recordings of phone calls, voice mail messages, memos, conference calls, and other audio files. QuickTate pays up to 0.5 cents for transcribing a word. The transcribers must pass several steps onboarding process to get hired on QuickTate. Initially, the transcriber has to sign up and then pass the tests and quizzes to finish the onboarding process. Then the transcriber must pay $20 to complete the background process. This background check process is mandatory since they work with elite clients who need their files to be protected. I admire how careful when they hire the transcribers since they require 3 references from either family or workplace or colleagues. Transcribers must have their own setup with required software to work. QuickTate will assign the job to the transcriber and send notifications to the email or Yahoo messenger. Daily Transcription pays the highest rates compared to the best transcription sites in the world. Their rate starts at $0.75 per audio minute to $0.85 per audio minute. Daily Transcription provides their services to the entertainment, corporate, and legal industries and in addition, they work with academic institutions. New applicants must submit the form with the resume. Once approved transcribers can start the work and get paid weekly by check. Tigerfish is one oldest transcribing company started its services in 1989. They are looking for transcribers in four subject areas – Medical, Technology, Legal, and Finance. Tigerfish supports almost all the major languages in the world. So, Tigerfish remains the best source to find online transcription jobs in different languages. And be advised that English is the primary language and every transcriber should able to communicate in English. Application process – The new users must transcribe three audio files following their style guide. Then they must explain about them and mark the known language. It is important to accurately specify the working hour per week in detail in their form. After submission, Tigerfish staff will contact directly if the application gets approved. The SpeakWrite is an online transcription company that serves over 70000 law enforcement, legal government, and other private clients. SpeakWire hires individual typist contractors who can work from home for their clients. Earn $0.005 to $0.006 per word. Here are the requirements to apply for the job – The typist must be a resident of US or Canada fluent in English, must be able to type at 60 wpm with 90% accuracy. Should have at least one year of experience for general transcription jobs and at least two years for legal transcription. And the transcriber should have set up their home office with a PC, Foot pedal, sound device and required software. Due to the sensitive nature of work, all applicants must clear Federal, State, and Local background check. It can take up to 30 days to complete the evaluation process. Typist earns $300 on average, while top performers earn $3000 per month. Get paid twice a month either by direct deposit or check. The Amazon MTurk is the best micro jobs site owned by Amazon. Thousands of employers post millions of microtasks for the workers. The workers can choose the tasks based on their interest and complete the tasks to earn money. Amazon MTurk is the best place to find simple transcription tasks, especially for beginners. Join Amazon MTurk, take the basic tests to unlock the tasks that pay from $0.01 to $5. Complete the tasks get paid via bank transfer or Amazon payments. Way with words was started in 2002 as an English audio to text service. Transcribers can earn money by transcribing the English audio, videos and customized transcription tasks. To get hired, you must complete the online and offline assessments, finally the assessment submission. Entry level transcribers can earn up to $0.40 per audio minute and the professionals can earn up to $1 per audio minute. Way with words pays via PayPal. Keep this freelance transcription site as the final option to join if you don’t get hired in the companies mentioned above. Reliable work from home job, work at your own convenient timing. Earn $500 to $3000 per month. Get recognized as a professional freelancer. Unlike some of the common online jobs, freelancers can grow in this career. No investment, no frauds, no payment delays. Get paid on time. Use the certificates provided by the established sites in the regular job for promotions. It’s not easy to get hired. Need great language and typing skills. Not the best freelance job. Need a calm place to work with concentration.